Order within 19 hours and 50 minutes to receive your order by Tuesday 23rd April. A cluster ring should glisten like a clear night sky, be worn with ease and be the main feature on any hand. 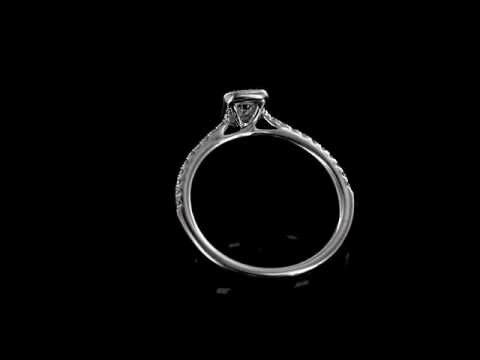 A ring such as this is timeless, it simply betters and is a simple must have. This stunning white gold diamond cluster ring has been seamlessly crafted out of 18 carat white gold to structure its perfect shank and setting. The plain shank works around the finger and faultlessly joins with the two diamond set shoulders which have been made up of individually set brilliant cut diamonds. These shoulders then graduate towards the centre diamond setting creating lower pierce decoration which is made up of the twisted claws which lovingly hold in the centre emerald cut diamond. The emerald cut diamond is held within a four claw setting and clustered with smaller brilliant cut diamonds which boarder it. The ring is available in various sizes, please state the size required when ordering. If you should have any further questions regarding this white gold diamond cluster ring then please do not hesitate to contact us.